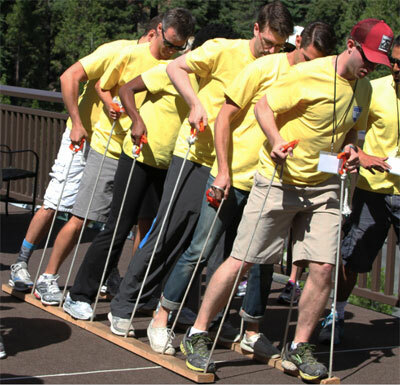 Company Sports Days are an increasingly popular team building event that give the staff an opportunity to escape the office for few hours and have some outdoor fun. Above is our Space Hopper Football. A great team game with 4-6 players per team competing against each other. Tournaments can be arranged on a knockout or league basis. Human Caterpillar Racing - a great racing game where teammates have to work together to feed the caterpillar track around themselves as quickly as they can. Centipede Ski Racing is another racing game where great communication between the team is required to ensure everyone moves the right leg at the right time. Arrow Tag Combat Archery is a cross between Archery and Dodge Ball. Above is our Giant Kick n Stick. 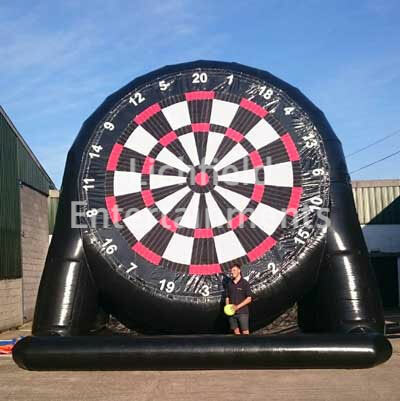 A huge attention grabbing game that crosses Football with Darts. 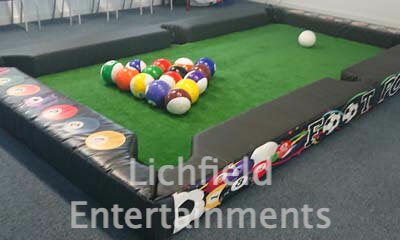 Our Bouncy Beach Volleyball is another great team game suitable for 2-5 players per team. 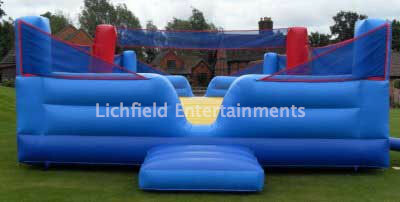 The bouncy court ensures a soft landing for those diving returns. Boat Racing is an interactive electronic rowing game for two to four players. 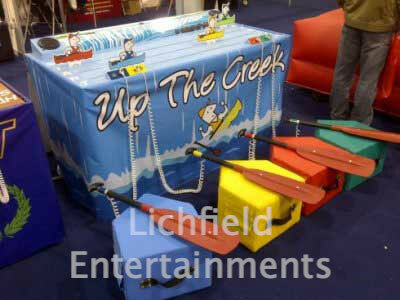 The players sit on the coloured bases and on the whistle start paddling with their oars. The oars are fitted with sensors and the faster you paddle the faster your boat will move along. The first to the finish line wins. Archery using modern recurve bows. A brief practice with instruction from qualified staff then the competitive shooting starts! This game can be used for either individual or team competitions. Disc Golf can be set-up to suit the space available, from a short throw game to a series of full on 200 yard holes if space permits. 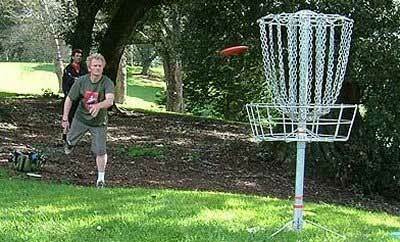 Disc Golf follows the same idea as traditional golf only the aim is to take a series of throws to hit an aerial target basket with your frisbee rather than putt your ball into a hole. The person, or team, using the least number of shots wins. We have Wipeout style games like our rotating sweeper arm. Suitable for up to six players at a time they have to stand on their marker and jump over the rotating inflatable arm each time it passes. If it strikes you, or you fail to land on your marker then you're out. The last man standing is the winner. We have adult Assault Courses available in either 70ft or 95ft lengths. 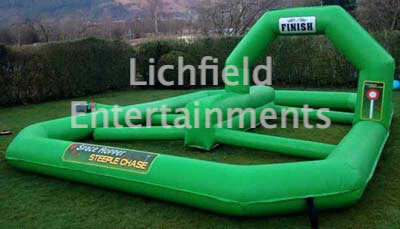 The participants race through the inflatable assault course in pairs through all the various obstacles with the first to the end is the winner. 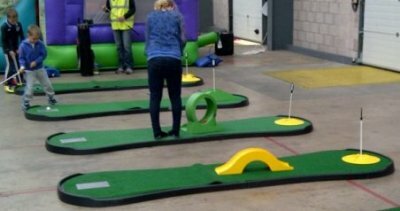 Add anything from a couple to nine Crazy Golf holes to your company sports day and hold your own company open (crazy) golf championship. Our Hopper Racing Tracks are great multi-player games suitable for 2-4 players at a time. Try and score a home run with our Baseball Strike game. 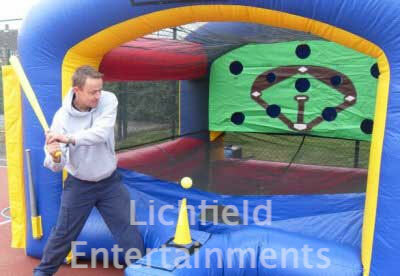 The ball hovers in an airstream coming from the front of the inflatable, and the object of the game is for the participant, using a safe foam baseball bat, to strike the ball from the airstream into one of the target holes and avoid the 'run out' holes. 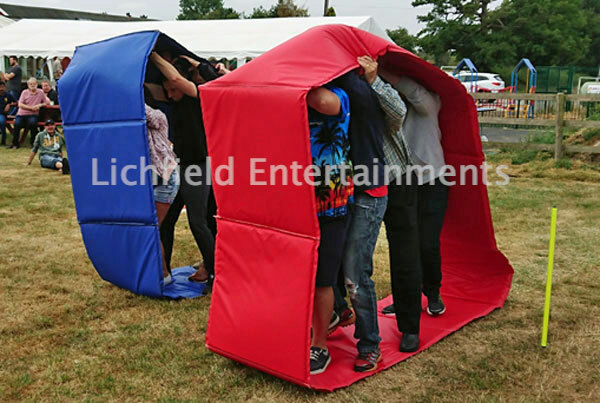 To discuss the games we can supply for your company sports day please get in touch via enquiries@lichfieldentertainments.com or call on 01283 792974.